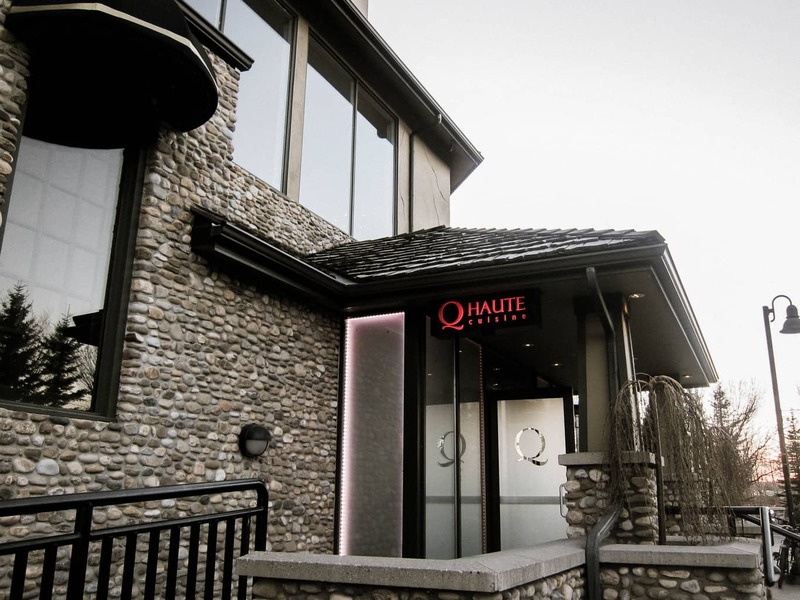 Known for its contemporary style of French cooking and impeccable service, Q Haute Cuisine will serve as a fantastic choice to spend the last day of 2015! Before you make your decision, read on and see if the food interests you! Few weeks ago, Kev and I had the opportunity to attend a corporate event being hosted at the restaurant. With its subtle, elegant décor, high ceilings, and sophisticated atmosphere, we thought we’d walked into someone’s luxury home. Leading us upstairs were the portrait of a fashionable bride and the cute chalk drawing of a newlywed couple on the wall. Evidently, it also provides wedding reception service and is an ideal venue for exquisitely elegant weddings. The menu changes seasonally ensuring you will always find something new to try. 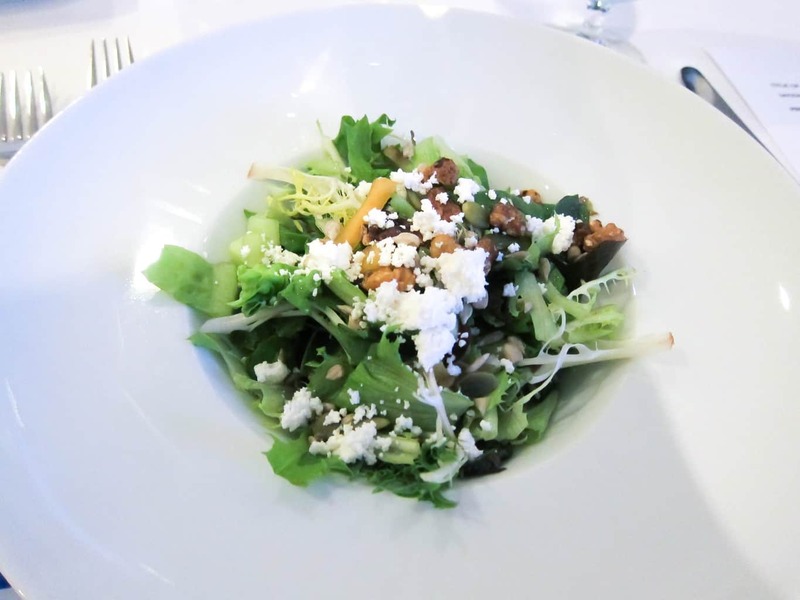 That evening, we started with a simple green salad, mixed with seasonal fruit, feta, candied walnuts and cardamom citrus dressing. Majority of the flavor was derived from the sweet melon and cranberries. The walnut yielded a delightful blend of sweet and salty, with a light and savory nutty crunch. Nonetheless, I was disappointed that the citrus dressing lost its flavor and didn’t enhance the salad in any way. 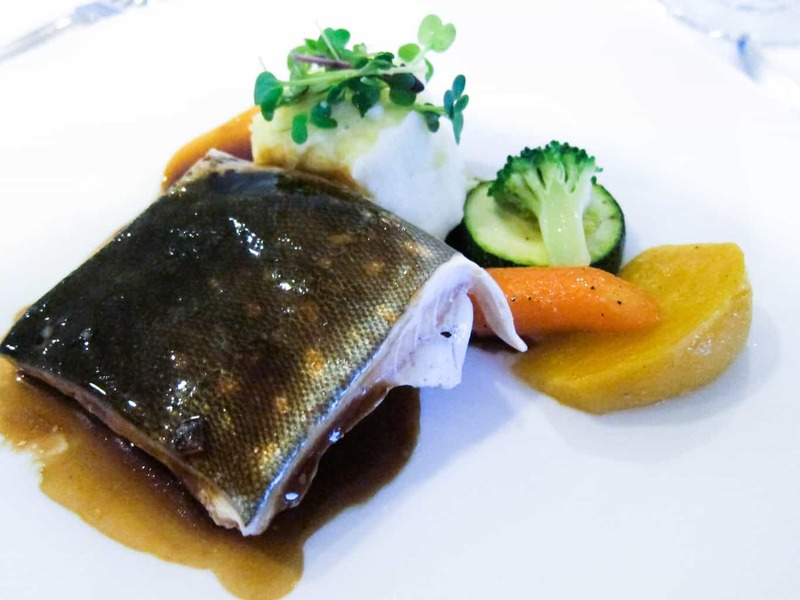 For the main course, I chose the sous vide arctic char with madeira jus. The technique of sous vide rendered the fish beautifully soft and moist, falling off the bone tender. The madeira sauce was an excellent accompaniment, by adding some smoky sweetness to the dish. The perfectly smooth, creamy mashed potatoes on the side was a delight. It is a consistent method of cooking by first vacuum sealing the ingredient in a plastic bag, then placing it in a water bath until the ingredient has reached its target temperature. A quick sear or other finish could be added before serving. Preparing your food sous vide prevents it from over- or under-cooking. It is closely related to both salmon and lake trout, sharing the characteristic richness of both. In fact, many consider it a ocean-friendly substitute for farmed salmon for its more delicate texture and clean, mild flavor. The high fat content in Arctic Char makes it suitable for dry-heat cooking such as broiling and smoking. Due to its high quality and rarity, Arctic Charis is expensive. Kev, on the other hand, opted for roast beef tenderloin with lactose sauce for his main. 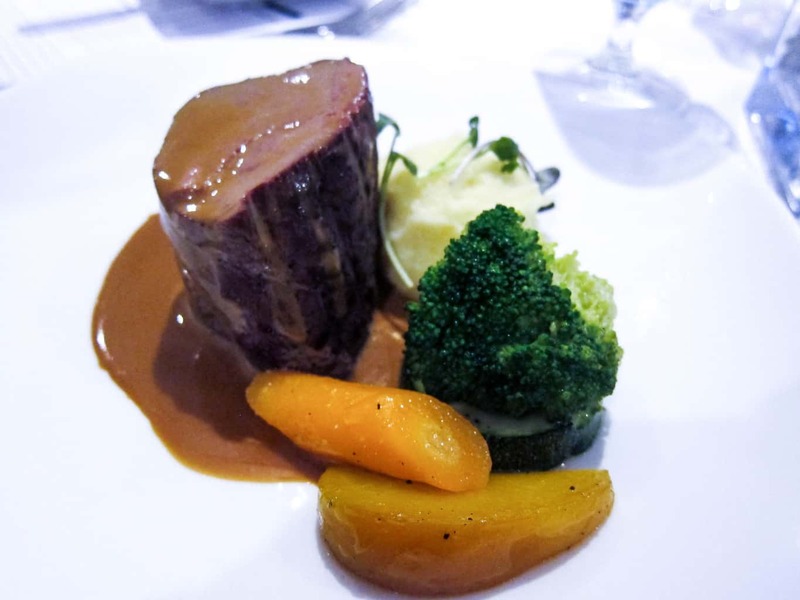 The medium-rare beef tenderloin got a nice crusty brown exterior without overcooking inside; however, it wasn’t so stunning that would get us rave about. In addition, we found that the sweet-tasting lactose sauce didn’t complement the beef so well – a savoury sauce would have been better. 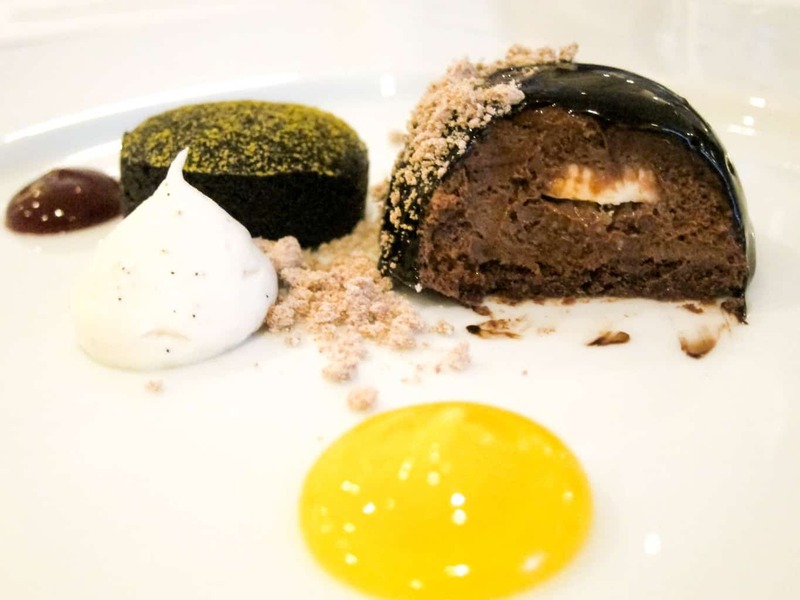 The chocolate plaisir gave a satisfying closure to the meal. The rich, dense chocolate mousse brownies paired beautifully with small puddles of black currant, cranberry and lemon sauces, creating a dynamic dish. The culinary journey presented to us by Chef Michele Aurigemma and his team showcased variety and finesse as it promises. Some of the dishes were not as impressive as others; nonetheless, the service and high quality ingredients made up for it. We are definitely interested in coming back to try out the value lunch ($20 for 2 courses, or $25 for 3 courses) or multi-course dinner!